Leaves are flat and leathery, one to two inches long, and sometimes serrated. Note the "Rhus" part of the name, that is the same genus as Poison Oak until it was reclassified. Common to Southern California, occurring in the coastal sage scrub, chaparral, and oak woodland below about 2,500 feet. This plant has small flowers with five petals and five sepals clustered at the ends of the stems. The flowers of lemonade berry are white to pink. The fruits are red, hairy, and sticky. It commonly blooms from February to April. 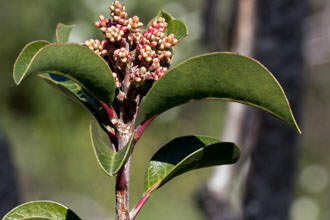 Sugar Bush, Laurel Sumac and Lemonade Berry are three similar looking plants you will encounter on many of your visits to the Santa Monica Mountains. Lemonade Berry seems to prefer the North side of the mountains, Sugar Bush prefers the Southern side and Laurel Sumac is not as choosy. 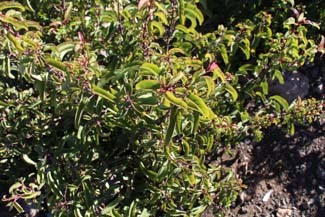 Laurel Sumac leaves are longer and less wide. Lemonade Berry is rounder and shorter, Sugar Bush is somewhere in the middle. Too make things more interesting - Sugar Bush and Lemonade Berry are known to hybridize! What separates the Lemonade Berry is the fruits. The fruits are similar in size to a pomegranite seed and look nothing like either Sugar Bush or Laurel Sumac. The Cahuilla and other California native people ate the fruits of the lemonade berry raw. They soaked the berries in water to make a beverage, and ground the dried berries into flour for a mush or to add to soup. It also has medicinal uses. 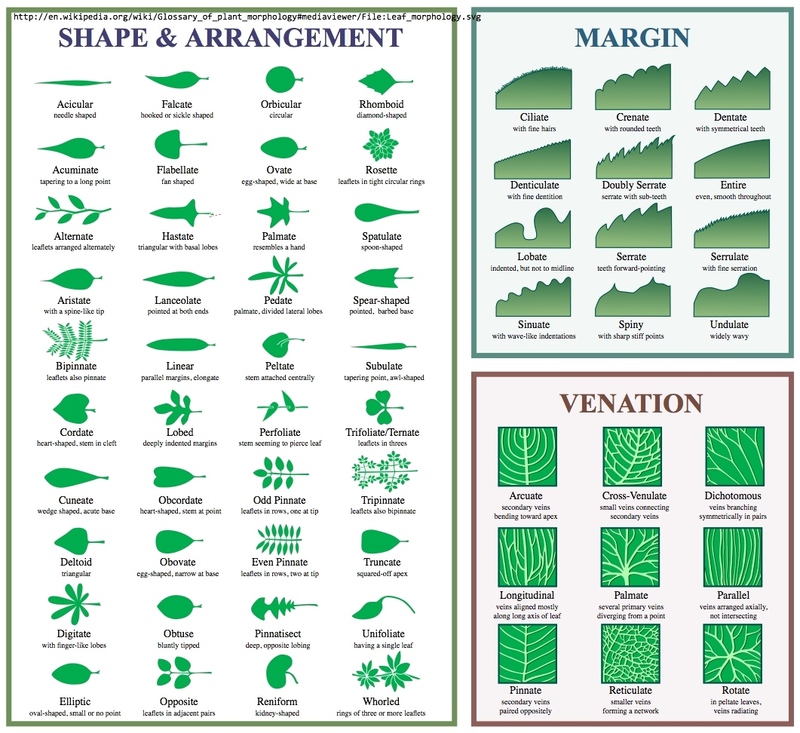 The following illustrates these aspects of the plant. 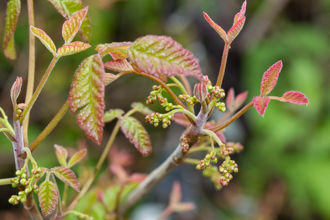 While you should not take it out of the park to try this at home, note that the plant and its cousin, sugar bush (Rhus Ovata), are both commonly used in landscaping or gardening, so, visit your local nursery to pick one up! Both like full sun to part shade and average soil. They are very adaptable and respond well to pruning - though topical exposure to the plant oils may cause a rash (a hint of their poison oak cousin?). Sugar bush is more heat tolerant than lemonade berry. Fire Response: Sprouts easily from stump after fire and is somewhat fire resistant. Easily grown from seed, this plant could easily replaced introduced plants in the landscaped areas of your neighborhood. Ripe berries of the sugar bush or lemonade berry can be soaked in hot water to produce a tart lemon-tasting beverage. Steeping in almost boiling water produces a stronger drink than steeping in sun-heated water. For a strong drink, you will need a ratio of one-part berries to two parts water. These berries make a tart snack if picked right off of the bush, but only if sucked for their juice; the pulp is not swallowed. The berries have small hairs that can upset your stomach. So, enjoy the bitter refreshing taste and spit the berry out when done. The dried berries can also be ground into flour and added to soup. Tea made from the stems can be used to treat coughs. The tea made from the bark, berries, or leaves steeped in cold water can be gargled for sore throats and cold sores, or you can drink it to alleviate diarrhea or urinary problems (best to use leaves for the latter). Caution: Some people are allergic to the bark, roots, and leaves, so use it sparingly the first time. Last modified: March 03 2019 19:29:40.